Many of my sculptures have been developed of the the past decade and originally emanated from a collection of paper and resin macquettes which I have exhibited in their own right. Much of the time involved in bringing my creations to life has been involved in the search for a foundry that would work with me. The original paper macquettes are firstly, wrapped in a rubber mold which then allows for a wax form to be taken and which provides a facsimilie of the original work. From here, this wax form allows for a casting to be taken. The initial bronze form is a bright brass colour to which a coloured patina must be applied and well as detailed modifications which make every piece unique, even though they originate from the same original. The Inspiration for my bronzes and garden art often derive from mythical creatures which are hybrids, a combination of two or more animals or from legends and myths. For example, with my bronze sculptures the centaur is a combination of a man and horse and my my Lovers bronze represents the duality of personality where the twin torsos are the physical manifestation of this state. These creatures are often claimed to have supernatural powers or knowledge or to guard family members or objects of great value. The subjects often possess a meditative quality. 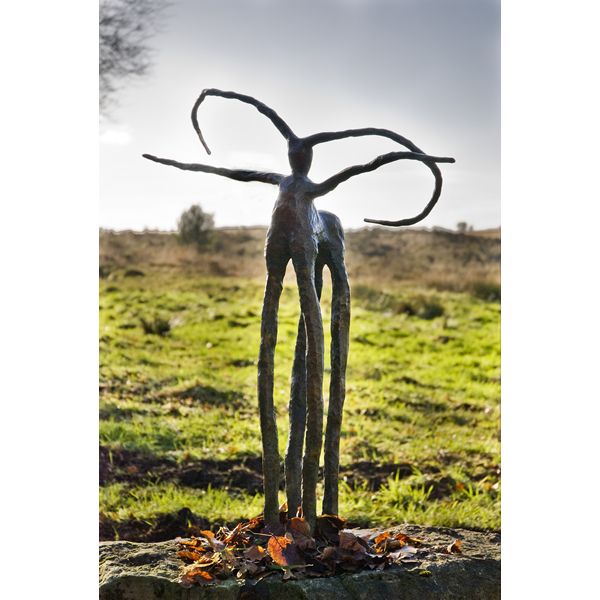 The large bronze sculpture is designed for private gardens and public spaces, and private commissions, whilst the smaller pieces are ideal to accompany water features or for smaller private gardens or urban spaces. 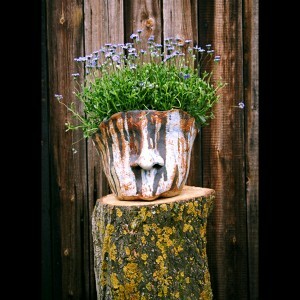 Using mainly stoneware I create work based on large sleeping heads with comical big noses. I like to exaggerate certain characteristics that stand out, particularly facial and I decorate them with subtle colours and oxides. The large heads are built from stoneware mixed with crank to make them frost proof for outside use, are fired at 1220 °C in an electric kiln. I uses a variety of methods of construction including coiled, slab, press moulded, and combinations of these processes. The clay bodies are coloured using oxides to achieve ‘rock strata’ effects. I have developed my own glazes which are vivid blues and greens, creating unusual and often unpredictable results. My Sleeping sculptural garden heads are based on vessel forms also inspired by mythical stories and from Roman and Grecian artifacts that I have a life-long fascination with. I have also been heavily influenced by artists such as Elisabeth Frink, Barbara Hepworth and Henry Moore. I particularly love the abstract and unusual forms of their sculptures, and which at times is both insightful and moving. Like Frink, I am also fascinated by the Green Man, the physical manifestation and representation of rebirth and the rite of spring and the expression of growth within us all.